Nitrous Express Maximizer 5 Progressive Nitrous Controller UNIVERSAL - Pann Auto Performance - San Diego largest aftermarket automotive performance parts - What do you drive? The Maximizer 5 features many safety features that help you push your tune-up further while protecting your engine from damage. The Maximizer 5 progressive nitrous controller operates up to four separate stages of nitrous based on either time, RPM, MPH, throttle percentage or boost pressure. Whether your engine is naturally aspirated or forced induction, gasoline or diesel, the Maximizer 5 is the first choice. The Max 5 monitors throttle percentage, engine rpms, nitrous PSI, boost or pan vacuum as well as 3 other user defined sensors to ensure that your engine is in the correct state to accept nitrous. If the Max 5 detects any condition that is outside the safe range, the Max 5 will shut down or pull back nitrous flow to protect your engine from any damage. The Max 5 is normally setup and tuned via a simple to use windows based laptop program. 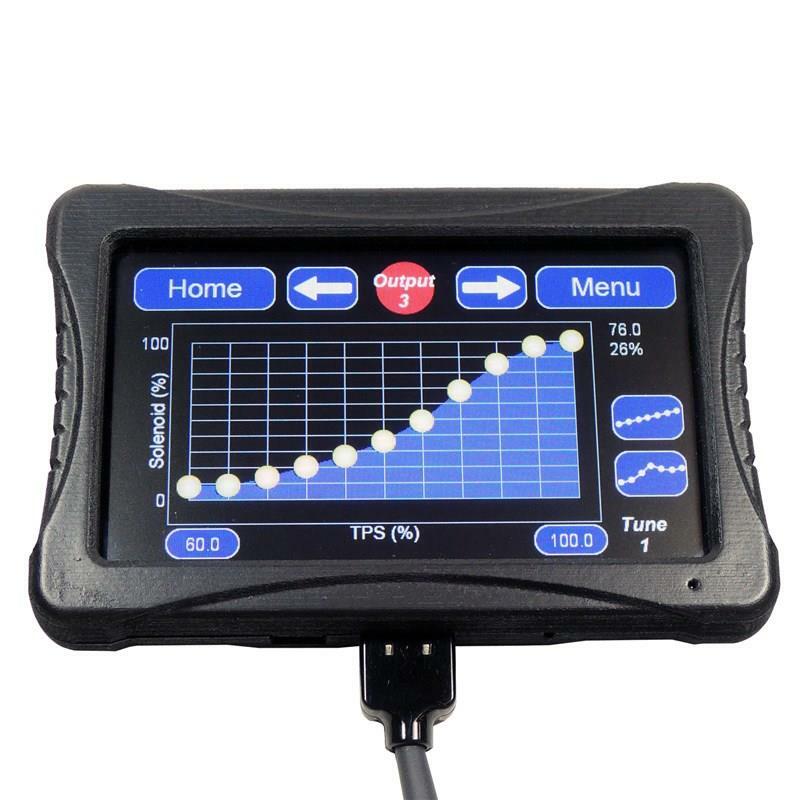 An optional 4 inch touch screen display can be connected to view and adjust common tuning parameters on the fly without the need for a laptop. The Max 5 automatically data logs all inputs (including 3 user defined inputs) so you can review important data for multiple previous runs. The Max 5 includes enough internal memory to store over 100 quarter mile runs before you need to save them to a laptop. The Max 5 includes internal drivers for stage one and stage two that handle 70 amps each or 140 amps in single stage mode. Stages 3 and 4 require external drivers which are available separately. This option is a popular choice for drag racing applications where you always start from a dead stop. This option is very easy to fine tune so that you leave soft enough to eliminate wheel spin, and increases power as you go down track, the controller smoothly adds more nitrous as traction increases. This option works great for vehicles that have enough traction to handle full nitrous power at the top of first gear. This mode allows you to add a little nitrous in the lower engine RPMs and ramp into full nitrous as the engine rpm increases. This is a great option for vehicles with a tight torque converter. Since nitrous flow is limited to a small amount at low RPMS, you can safely activate the nitrous at lower RPMs which will help to pull the car out of the hole. This option is great for racers who sometimes begin racing from a dead stop and other times begin racing from a rolling start. The nitrous controller will automatically limit nitrous to a smaller boost at low speeds where traction is limited while providing a larger boost at higher speeds where traction is more plentiful. Bracket racers can use this feature to set a MPH nitrous cutoff for the ultimate in consistent ETs. This option allows you to “pedal” the car in the event of wheel spin. Nitrous flow smoothly increases and decreases as you “work” the throttle, allowing you to regain traction and continue racing. This is very beneficial to road race and drifting vehicles. The throttle percentage feature is also beneficial for street cars because it allows you to introduce a small amount of nitrous at mid throttle while smoothly transitioning to full nitrous power as you press the throttle to the floor. The feeling is like driving a car with twice the cubic inches. This is a useful option for turbocharged diesels and gasoline applications. Boost progression allows nitrous to come on strong to eliminate that dreaded turbo lag, then ramps out the nitrous smoothly to let the mighty turbo do its thing. The end result is monster power with zero lag, even with a HUGE turbo. On diesel applications it will not allow full nitrous delivery until the engine starts to build adequate boost, preventing a nitrous engine stall. Injecting nitrous into a diesel application lowers EGTs. This is a useful option for diesel applications that don’t want to use nitrous all the time but still want the EGT lowering properties that nitrous provides. EGT based progression allows you to create a safety ramp which will only add nitrous if EGTs rise to unsafe limits. Compatible with all EGT modules that have a 0 to 5 volt output signal. The Maximizer 5 monitors the engines Air Fuel Ratio (from aftermarket wide band O2 module), and automatically adjusts the fuel and nitrous solenoid output to achieve the desired Air Fuel Ratio (target AFR is user adjustable). As bottle pressure drops toward the end of a run, the Maximizer 5 will automatically adjust the solenoid output so you maintain a consistent and safe AFR. Air Fuel Ratio safety cut off limit (too rich and too lean) are user adjustable so the controller will completely shut off nitrous flow if the Air Fuel Ratio goes outside the user defined limits.